There’s something both relaxing and regenerating about a trip to Rome. No other city quite matches the heady mix of mighty and mundane, politics and passion, past and present. With an almost infinite list of museums and masterpieces, Rome is ideal for return visits, knowing that the eternal city will be waiting for you when you come back. 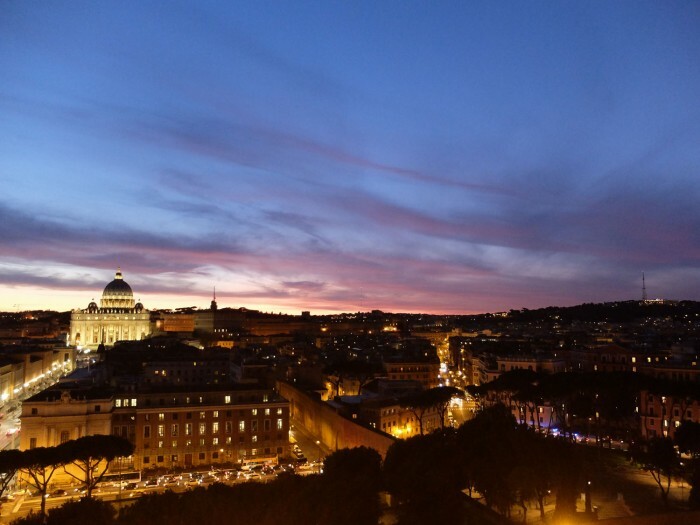 On a recent long weekend, I recharged my creative batteries with the following three day Rome itinerary, alternating pampering time spent at Rome’s top five-star Hotel de Russie with culture, shopping and great food. Of the many ways to experience Rome, this is one of the most pleasantly balanced: not too heavy on the museums, not too traditional in the food department, everything designed to seize the spirit of the city. 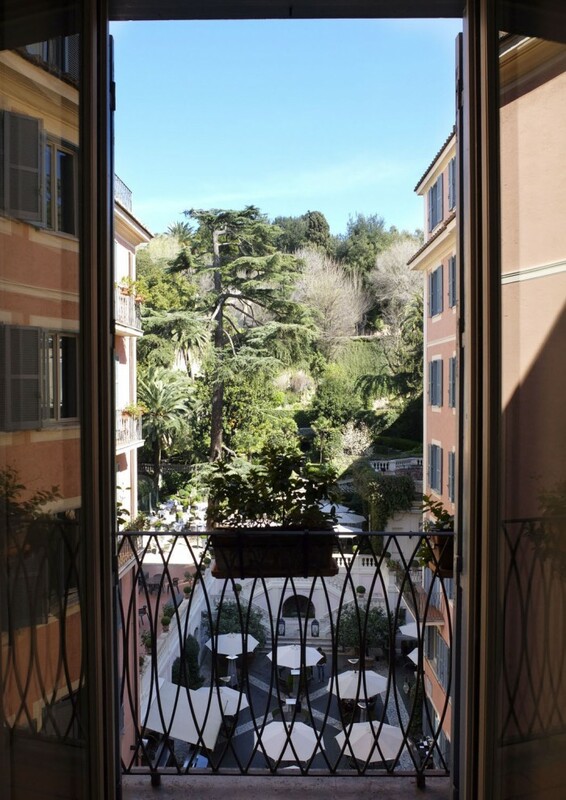 Arrive by train or plane; hop on the subway or take a taxi to Piazza del Popolo and check in at Hotel de Russie. This historic hotel, purpose-built by Giuseppe Valadier in 1814, was described as “paradise on earth” by Jean Cocteau, and frequented by Russian nobility and Romantic painters (hence the name). Lovingly renovated by Rocco Forte Hotels in 2000, the structure has 88 bedrooms and 34 suites, including four signature suites. While they’re all fabulous, art lovers might appreciate the one dedicated to Picasso most of all: the artist stayed at the hotel in 1917. 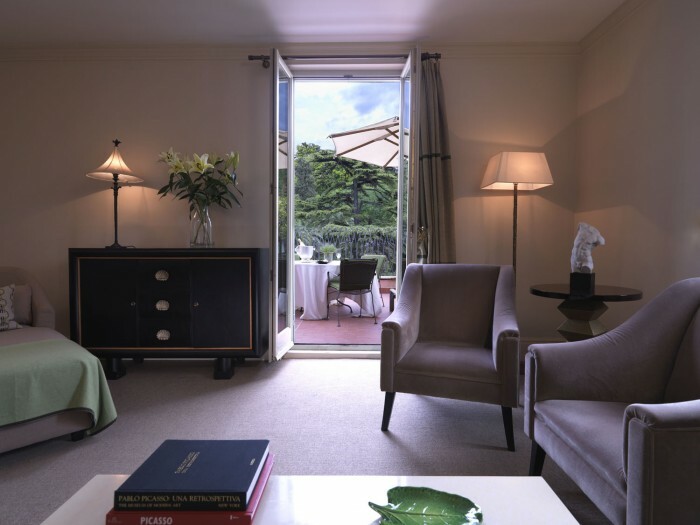 The top-floor Suite Picasso boasts original lithographs in the living area and a large private terrace that overlooks the hotel’s beautifully verdant garden. If your room isn’t ready yet, the attentive staff will safely store your things and you can freshen up before heading out on the town. 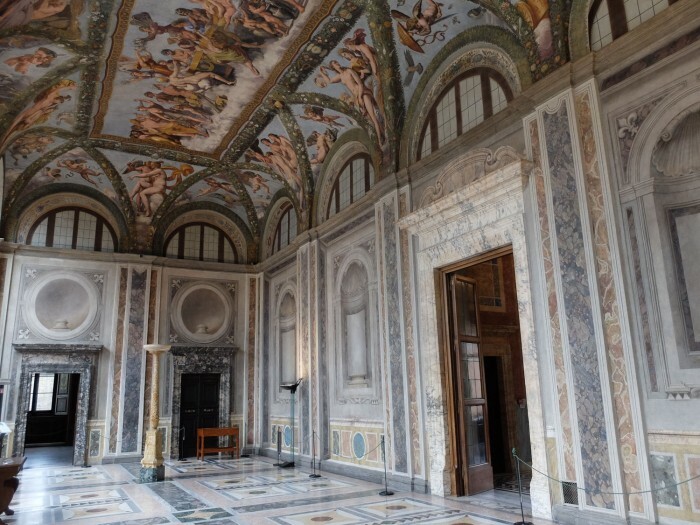 Take a taxi across town to Trastevere to visit Villa Farnesina, where one rich Renaissance banker had parties that easily rivaled Berlusconi’s bunga bunga blasts. Opulence and sycophancy are words of the day in a fresco cycle designed as a nod to the papal power struggles and politics of the day. Agostino Chigi was banker to Julius II, whose artist, Raphael, he borrowed to decorate his new pleasure palace on the banks of the Tiber. Free from the historical “constraints” of either nobility or the church, Chigi’s architecture and iconography are a model for secular wealth and luxurious living. While the villa closes at 2pm, staff begin to sweep you out just past 1. 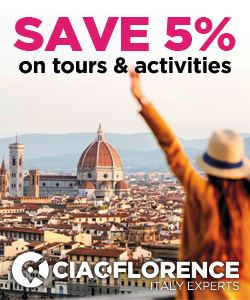 Take advantage of this moment to find yourself alone in the rooms that are frescoed floor to ceiling, on the ground floor by Raphael and his workshop member Giulio Romano (responsible for the fabulously decorative swaths of vegetables and greenery), upstairs by Baldassarre Peruzzi and Il Sodoma. 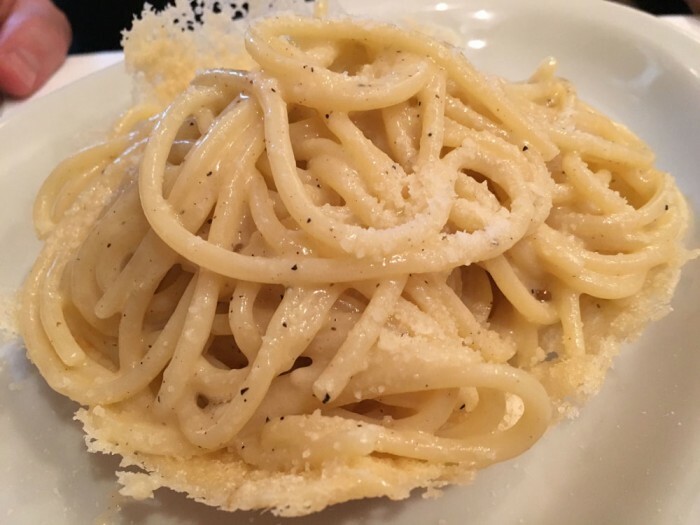 It’s about a 20 minute walk, crossing the Tiber at Ponte Sisto, to get to Vinando (Piazza Margana 23, 06/ 69200741), a real Roman-style restaurant that is dangerously close to the Campidoglio and the tourist heart of the city. Despite this, it’s maintained a high level of quality, if not a slightly higher than average-trattoria prices. The menu proposes a lot of fish options and tons of vegetables, but just as many meat dishes. Surprisingly, for a wide menu, everything is prepared with care and most items seem to be available. Puntarelle, artichokes with anchovy sauce, chicory and cabbage are featured on the winter menu; grilled squid, sea bass and homemade gnocchi are worth writing home about. On a full stomach, take a taxi and have him drop you off in front of the church of Santa Trinità dei Monti, avoiding the walk up the famous Spanish Steps. The view from here expands South-West towards the Vatican, worth snapping a photo! You’re standing on French property – the church and the Villa Medicis next to (which houses the French Academy) have always been under the patronage of the French kings, although the very strict French nuns who used to run the church have recently moved out. Head inside the late Renaissance nave, one of the few to preserve a bronze gate about halfway down. The church attracted the patronage of numerous important families in the 16th century. 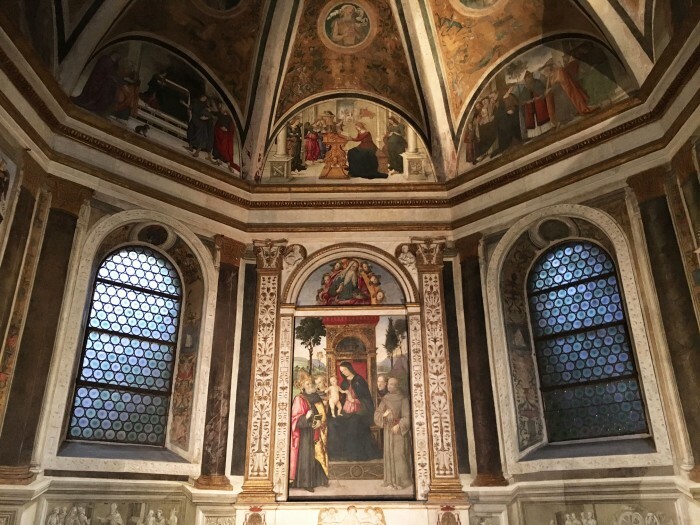 Of particular interest is the third chapel on the right for its rare female patronage: the illusionistic frescoes by Daniele da Volterra and workshop were painted for Lucrezia delle Rovere. Head down the Spanish steps (currently closed for a major restoration funded by Bulgari) and you’re in Piazza Spagna, the heart of la bella vita in Rome. 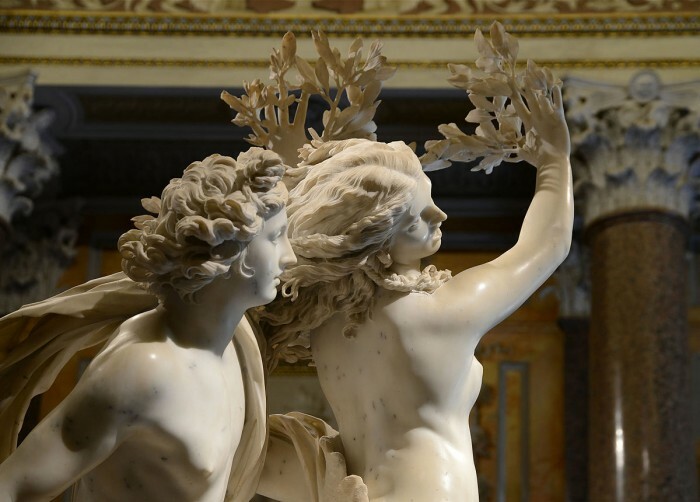 The fountain by Bernini at the bottom, called the Barcaccia, has just been restored by a private donor, and the area has seen a few interesting new openings. The large windows of the new Valentino store recently hosted Ben Stiller and Owen Wilson as models to promote their film, Zoolander II. Down the street at Largo Goldoni is the recently renovated Palazzo Fendi, headquarters of the quintessentially Roman brand that paid for the restoration of the glorious Trevi Fountain (costing €2M). 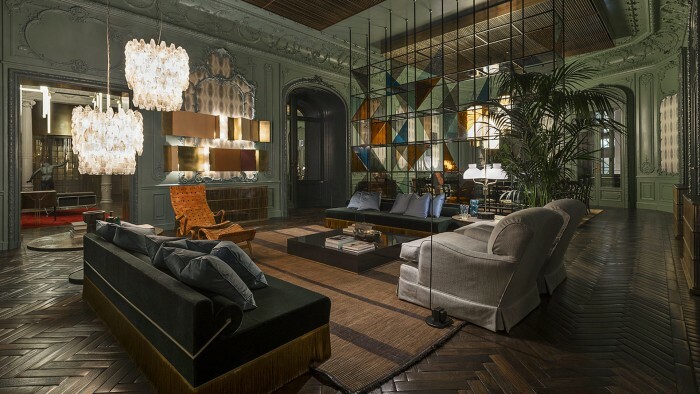 Around the corner on a discreet side street one accesses the front door of the newest boutique hotel on the scene, Fendi Private Suites, designed by architect Marco Costanzi and opened in January 2016 to show off the Fendi Casa line. After all that walking (and perhaps shopping) you deserve a break. 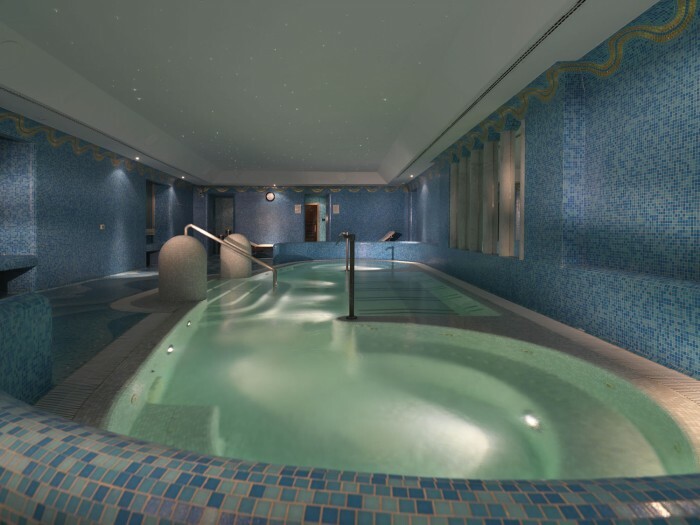 Claim your room at Hotel de Russie and head downstairs to the spa, which features a salt-water whirlpool, saunas and relax area. A rest, shower and fresh outfit later and you’re ready to hit the town. 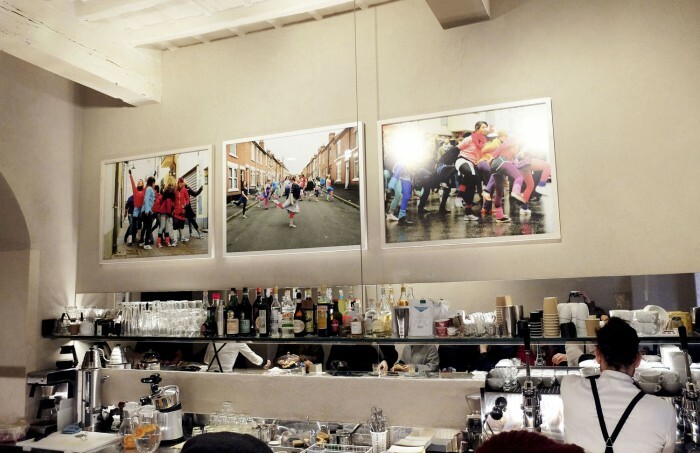 The Stravinskij Bar at the Russie is a destination for the city’s elite – models and actors who want to be seen, politicians and magnates who don’t. Sit outside in the garden and sip a cocktail, or choose the comfortable and discreet indoor bar for quiet conversation. Ready for dinner? Walk just around the corner to Babette (via Margutta 1/d, 06/3211559), a chic spot inspired by the owner’s childhood visits to Paris. Sophisticated Mediterranean cuisine that they call “alta cucina casalinga”, excellent presentation and service, and French desserts. After dinner, take a stroll in the footsteps of Audrey Hepburn, who zipped down via Margutta on the back of a Vespa with Gregory Peck. Peck’s character lived at number 51, which now hosts artists studios. If you’re the type who likes to start the day with an energizing run, don’t give that up while in Rome. 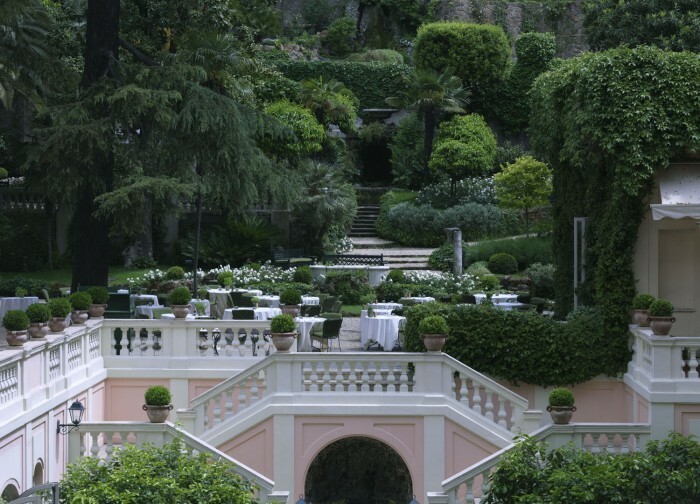 Hotel de Russie backs onto one of the city’s best green spaces, which on the weekend attracts numerous joggers. If you need motivation, sign up for the hotel’s Art Running program: triathlete Danilo Palmucci will pick you up at the hotel and take you on a one- hour route dotted with architectural marvels. By now you will have admired the hotel’s marvelous garden from afar, but take the time to stroll through it and walk all the way to the top! The pink-toned building embraces the garden, which extends from Via del Babuino up to the Pincian Hill and merges into the Villa Borghese Park. Noted already in the 17th century, its current 18th-century form was designed by the important Neoclassical architect Giuseppe Valadier and recently restored when the building and garden were taken over by the Rocco Forte Hotel group. You can walk or take an ATAC bus or metro over to Monti, my favourite area of Rome for the way its little streets have preserved authentic boutiques and bars, and Roman residents, despite being literally around the corner from the Colosseum. Two streets, via dei Serpenti and via Boschetto, define the area. On weekends there is a fun creative market called Mercato Monti (via Leonina 46, near Cavour station on Metro B) that serves up a hip mix of vintage duds, stylish craft accessories and high street stock clothing. Nearby independent boutiques are some of the best sources in Rome for men’s and women’s clothing as well as home accessories. 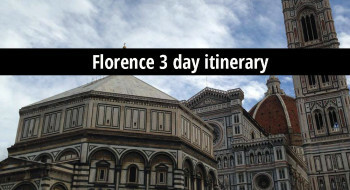 Continue wandering a bit further afield, if you wish, heading over to the famous Campo dei Fiori to drool over the amazing range of local vegetables at the market stands. 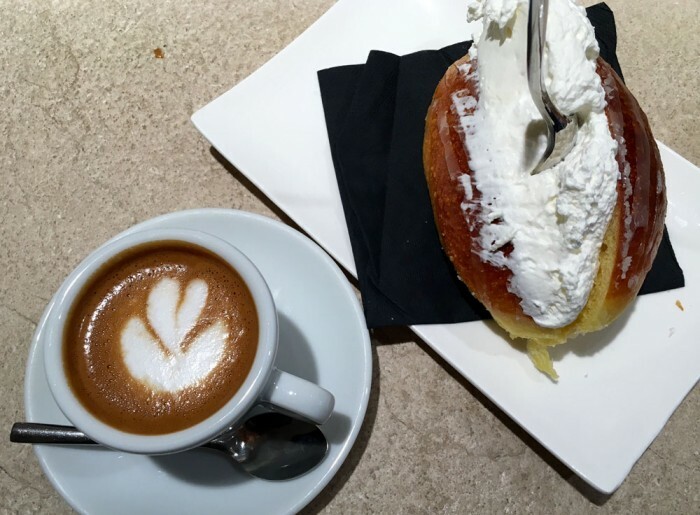 Make a detour mid-morning to the new Roscioli Caffé e Pasticceria (piazza Benedetta Cairoli 16) because you absolutely must taste the whipped-cream filled maritozzi, a sweet brioche-type bread that is what Romans ate before they invented the frozen cornetto. This is a maritozzi at Roscioli – now you see why you must have one? Another reason to hang around in Monti is this small restaurant that you’ll recognize only due to the old painted sign on the front that says Birreria. Actually called Trattoria Valentino (Via Del Boschetto 37, 06/4880643, reservation recommended), the main item on the menu is the grilled scamorza cheese, combined with any number of items like spinach, oranges or radicchio. Order a side salad and a basket of bread with that. It’s divine. 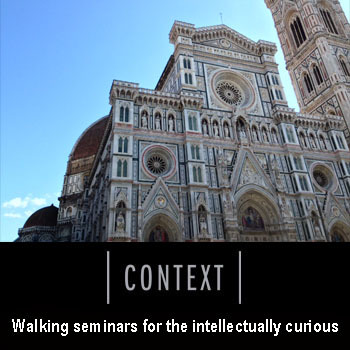 For the afternoon, plan a long walk, winding through Rome’s streets and pausing to observe the mix of ancient and modern that it has to offer. From Monti you can take via dei Serpenti all the way down to the Colosseum and take some time reading the friezes on the Arch of Constantine. 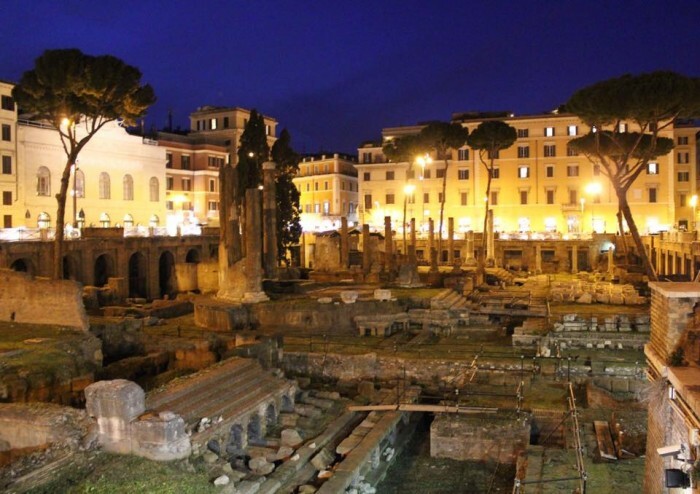 Or take a more direct route, backing up onto via Nazionale and from there heading West, stopping by the excavations at Torre Argentina – best known for its cat colony but also remembered for being the location of the assassination of Julius Caesar on the Ides of March (on his way to the forum, which was a building on one side of this piazza). Exhausted from all that walking? Rocco Forte has a solution: the Ancient Roman spa ritual. The hotel chain has recently presented a new line of spa products and treatments that is customized for each location, but has in common the use of exceptionally high quality organic products made from ingredients cultivated on their Sicilian property, Verdura Resort. These are my feet during a spa treatment. It was great! The Ancient Roman Ritual is perfect for soothing tired and sore feet after a day of sightseeing. 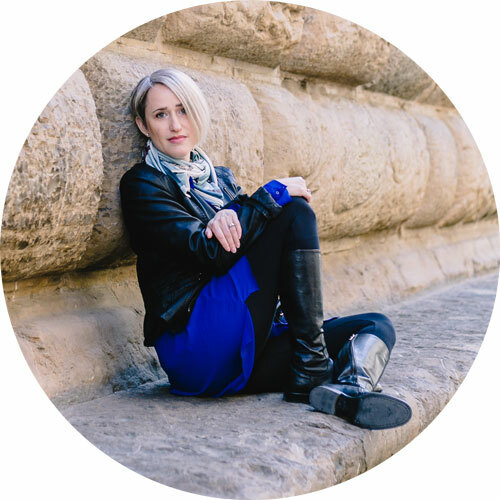 The ritual begins with a relaxing warm foot bath of volcanic stones, essential oils and flower petals, followed by an exfoliation with an energizing blend of oils, sea salt and flower petals. A relaxing mask is applied after which, feet are cocooned in a thin paper wrap. The experience concludes with a reflexology massage and moisturizer. Sufficiently relaxed from the spa, call a taxi to whisk you away somewhere fancy for dinner. 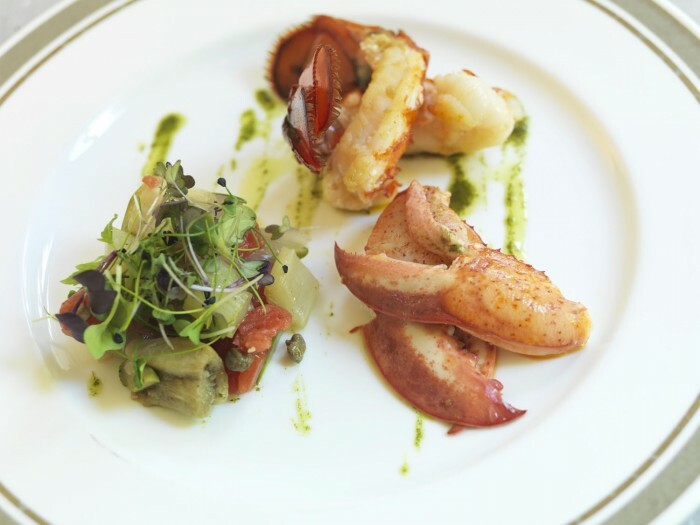 The concierge can recommend a range of excellent restaurants. Amongst the most famous might be the 2-star Pagliaccio (via dei Banchi Vecchi 129a, 06/68809595) by Chef Anthony Genovese, who trained in France and received his first Michelin star at his restaurant in Ravello. Start the day off with the excellent breakfast at the Hotel de Russie – you can ask for a fruit and vegetable juice to be prepared for you on the spot, highly detoxifying… Check out of your room, then put on your comfy shoes for a stroll through one of Rome’s most important green areas, the villa Borghese park, which the hotel backs on to. Advance-book your 10am entry to the Borghese museum, which allows you precisely two hours inside to enjoy its collections. 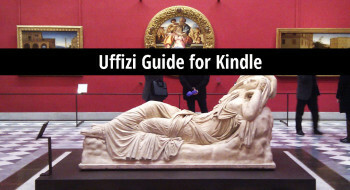 For most, this is just the right amount of time to hit up masterpieces like Titian’s Sacred and Profane Love, the Deposition by Raphael, and the fine sculptures by Bernini and later Canova. The collection of Cardinal Scipione, that forms the nucleus of this museum, is one of the most consistent groupings of Renaissance art that exists today. Head back home to the Russie for the Jardin de Russie brunch (available 12:30-15:30), considered one of the best brunches in Rome. 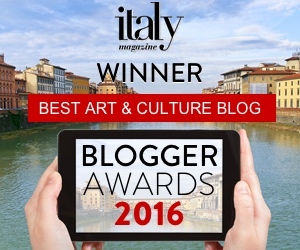 Check out the recent review with photos on Heart Rome blog. 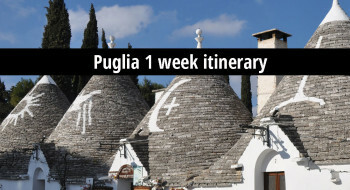 If, like me, you feel that this itinerary didn’t contain enough churches for a good Roman weekend, you can always pop into Santa Maria del Popolo on your way out of the city, as Piazza del Popolo is right next to the hotel. This is one of my favourite churches in Rome because it is testimony to three important moments in the Renaissance. The first is the presence of Pinturicchio, one of the artists who first interpreted the designs found when he and other artists were crawling underground discovering the ruins of the golden house of Nero. The fantastical scrolls, funny masks and vases were interpreted in a style we call grotesque, and you find it in the margins of the frescoes by Pinturicchio and other artist of his time. At Santa Maria del Popolo there are two chapels (first and third on the right) decorated by him that are testimony to this trend in the 1490s. On the left side of the nave, the Chigi chapel, designed by Raphael for the banker we met the other day, Agostino Chigi, ought to have been a truly spectacular and harmonic combination of painting, sculpture and architecture. It was left unfinished and completed, much changed, by Bernini for a papal patron in the same family some 125 years later. Then, of course, is the reason most people visit this church: the Cerasi chapel with paintings by Caravaggio representing the Conversion of Saint Paul and the Crucifixion of Saint Peter (while the altarpiece is by Annibale Caracci). People have been visiting these paintings of Rome’s two patron saints in-situ since 1601, admiring how the artist developed a modern style using dramatic chiaroscuro and oblique angles that can only be interpreted when seen within the entire context of the chapel. Sated, relaxed and creatively stimulated, it’s time to head home, knowing, of course, that you’ll be back soon. With thanks to the Hotel de Russie for hosting me during my stay in Rome.